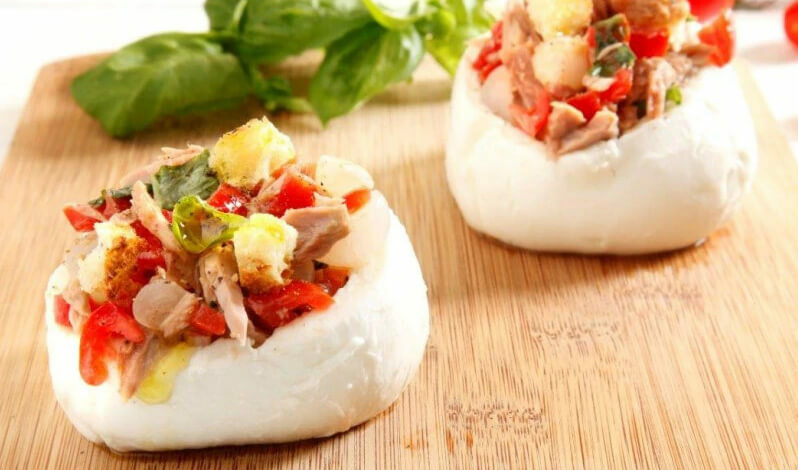 Stuffed mozzarella with tuna, baby onions, sautéed bread and cherry tomatoes is ideal for your summer appetizers. An easy and quick recipe to prepare. In fact, it requires only a few minutes of cooking for the croutons. The basil, added just before serving, will add a touch of freshness to the dish! Good and fresh, the mozzarella is the star of many summer dishes and tasty appetizers. The recipe for stuffed mozzarella is a perfect example: it is quickly prepared and does not require cooking. You just prepare the ingredients and heat a pan a few minutes to toast the bread. Stuffed mozzarella is an easy recipe that does not require any cooking skills. To obtain a satisfying result, it will be sufficient to use mozzarella that is large enough to contain tuna, onions, croutons and datterini tomatoes. Moreover, the mozzarella filling can vary according to your tastes. You can prepare, for example, a vegetarian version, without the tuna, and with hard-boiled eggs. Drain the tuna and break it, cut the bread into cubes, tomatoes and onions in half. Then cut the top of the mozzarella and dig the inside. Turn it over so that it releases any excess of liquid. Sauté the bread in a pan for a few minutes, being careful not to burn it. In a bowl mix all the ingredients with some basil leaves. Stuff the mozzarella with the ingredients previously mixed together. Serve the stuffed mozzarella with a few drops of extra virgin olive oil.